Make a splash in the bathroom without getting in over your head. Bathrooms are a place of relaxation and comfort, as well as a popular room to remodel. Bathrooms serve as an escape from the hectic everyday stresses of work, family, and other worries. So when you start to see signs of deterioration, or simply desire to see the latest designs, you might want to think about doing some upgrades. If you want the satisfaction of knowing you put your own sweat and tears into reconstructing a portion of your home, a DIY bathroom project can be the perfect solution for you. You can test your skill level, get to know your limitations, and learn new skills that could help in future projects. But don’t forget that some bathroom upgrades should really be done by a professional. A professional will be able to tackle common issues with bathrooms like mold, mildew, rotting wood, re-sizing windows, installing sky lights and exhaust fans. Be clear about what you are capable of, and what you don’t want to do, and look for a pro who can work with you to create the bathroom of your dreams. Change out fixtures: Changing the fixtures on a sink, toilet, shower, or tub, swapping out cabinetry knobs and pulls, or replacing the hardware on doors and windows are among some of the easiest and most inexpensive DIY modifications that can update the look of your bathroom and add value. There are dozens of on-trend styles available in big box stores offered at a great value. Or you can order high-end fixtures and install them yourself. Paint the walls and cabinets: Tired of wallpaper or the aging paint color on your bathroom walls? Adding a fresh coat of paint renews the space; selecting a trending color can revitalize a dreary décor. Scrapbook your favorite colors by browsing projectszfbzcuyqsybrvyararsyawfcfawwursr. Read how to repaint your cabinets here. 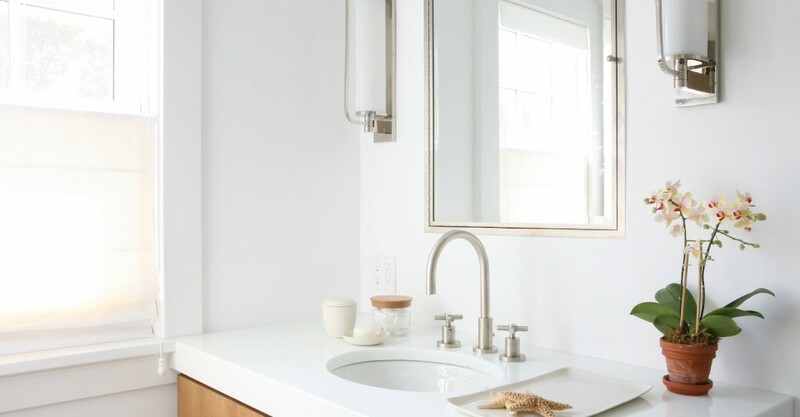 Upgrade your mirror: Believe it or not, it’s fairly easy to upgrade your standard builder’s-grade mirror. Read our article about how to do this here. Decorate and accessorize: Accessorizing your bathroom really does add a sense of sophistication and value. Think about coordinating bathmats, towels and window coverings or selecting matching toothbrush and soap holders to add to the overall appeal of your bathroom. These upgrades aren’t permanent, but they make a lasting impression and are easily interchangeable with seasons or current trends. Laying tile: Whether it’s for the floor or for the shower/tub surround, laying tile takes skill and experience. Often times, tile needs to be cut to fit into small, awkwardly shaped corners and getting the spacing of grout lines perfect can be an art form in and of itself. Let the pros get this one and save yourself some frustration. Moving electrical and plumbing: If your bathroom remodeling project requires electrical or plumbing work, you may not want to do this yourself. You’ll want to make sure your bathroom is up to code, safe and efficient. If your budget is tight, consider hiring a pro on a project-by-project basis or ask for a consultation to see if your plans are up to code. Installing Cabinets: Making sure you have enough storage in a bathroom is a concern for most homeowners; getting the right cabinets can prove to be an even greater concern. Cabinet boxes can range anywhere between $500 to $1,500 per box. Based on one eight foot long wall of two foot-wide cabinets you could be looking at spending $2,000 to $6,000 on cabinets alone. Unless you’re up for the challenge, call a master carpenter to do the install. Major structural changes: Adding or subtracting walls, inserting windows, installing exhaust fans or altering the ceiling may best be left to the professionals. Some of these changes or additions may require a permit, and others may required skilled laborers with experience. It might also be prudent to hire a pro to render architectural drawings and elevations of the room. In fact this may be a necessary part of the permitting process. Hazardous situations: Issues relating to the removal of mold, mildew, asbestos, lead paint or polybutylene piping should be handled by a professional. Very old homes may also have antiquated systems, like old wiring, that could be hazardous to the inexperienced remodeler. Consider hiring a pro for a consultation to at least get a better understanding of the overall scope of your project before diving into this type of remodel on your own. Think you might need a pro for that bathroom renovation you’ve been needing? Find local help using the Porch or if you’re simply needing inspirational ideas, check out these beautiful bathroom designs.